Born and raised in southeastern Michigan, Dennis Neely is an award winning freelance writer and photographer. He is an active member of the Michigan Outdoor Writers Association and the Outdoor Writers Association of America. Dennis is considered by some to be one of the foremost authorities on traditional black powder hunting. 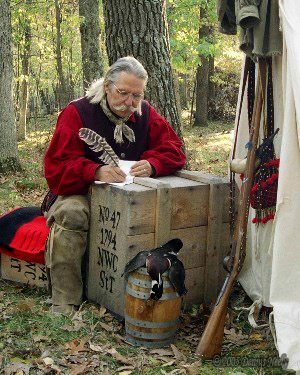 For over 35 years, he has pursued and taken white-tailed deer, wild turkeys, small game and waterfowl with a flintlock smoothbore called “Old Turkey Feathers” while dressed in the linen and leather clothing of a 1790-era backwoodsman. His engaging 18th-century essays are based on actual hunting exploits near the headwaters of the River Raisin, and his stories help preserve America’s rich hunting heritage for loyal readers in over 60 countries. Dennis writes two monthly columns, “Traditional Black Powder Hunting,” and the “Black Powder Shooting Sports.” His “River Raisin Journal” essays are a collection of nature reflections, transcribed from actual journal entries that touch on a broad spectrum of outdoor activities on a southern Michigan farm that borders the River Raisin. In addition, Dennis’ “Small Town, Anywhere” series focuses on the fond memories, youthful impressions and painful life lessons associated with growing up and staying in a Midwestern small town.